Lives intersect in weird and complex ways. The notion of community itself is an interweaving of disparate yet intertwined stories, pulled together by dark threads… because there is something dark about suburban communities. 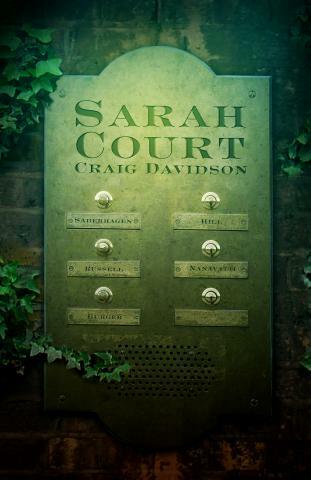 They are built of bricks and blood mortared together by darkness and Craig Davidson’s Sarah Court removes those bricks one by one to reveal the way that communities are built of secrets and suburban streets are tarred with shadow. Sarah Court follows the lives of a group of neighbours as they proceed through scarred, painful, damaged lives: parents pushing children past the point of their body’s tolerance, foster parents pushing their charges into sociopathic states for their own dark desires, and a man addicted to increasingly dangerous displays of daredevilry. Davidson illustrates the manipulative currents flowing through any community. Even things like self-sacrifice don’t create positive change. Good intentions brick the path to hell, and hell is as close as the rest of suburbia. The real horror of the novel is made up of people who mean well. Davidson reveals the dark aesthetic underlying the real world. To discover more about the work of Craig Davidson, visit his website at http://www.craigdavidson.net/ . This entry was posted in Fiction Book Reviews and tagged body, ChiZine, Craig Davidson, horror, reviews, suburban.